HOT, cold, wet, dry, snow, drought, flood, heatwave, blizzard – it’s ALL “global warming” aka “climate change” aka “climate disruption” and it’s ALL your fault! Graph from p3768 of J. Hansen et al. : Ice melt, sea level rise and superstorms. Does record breaking winter cold cast doubt on climate predictions of milder winters? Could ANY weather or climate shift cast doubt on the dominance of that wicked little trace molecule? Apparently not, according to leading climate explainers. This week’s cold snap has brought record-low temperatures, freezing rain and heavy snow to much of the United States. But 2017 is still on track to be the second- or third-hottest year ever recorded globally — and scientists say climate change is to blame. Even this week’s cold weather is probably being caused at least in part by global warming, said Jonathan Overpeck, a climate scientist at the University of Michigan. The fact that during last year 81 of 100 Swiss glaciers decreased in size did not in any way indicate that the earth was becoming warmer and drier, said professor H. C. Richards, Professor of Geology at the Queensland University, yesterday, commenting on a message from Geneva concerning a world-wide drought. 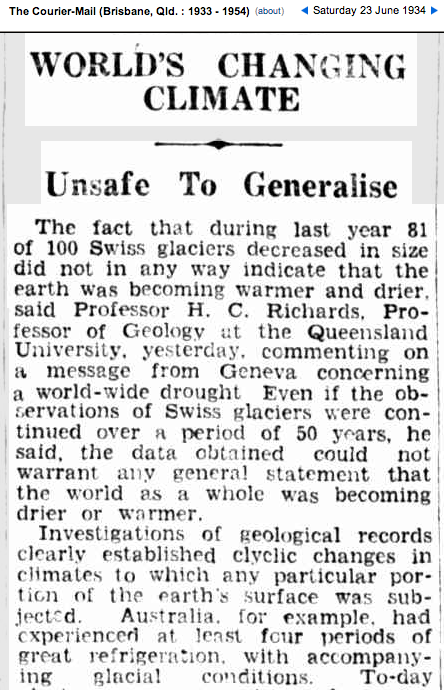 Even if the observations of Swiss glaciers were continued over a period of 50 years, he said, the data obtained could not warrant any general statement that the world as a whole was becoming drier or warmer. Investigations of geological records [show] clearly established cyclic changes in climates to which any particular portion of the earth’s surface was subjected. Australia, for example, had experienced at least four periods of great refrigeration, with accompanying glacial conditions. CO² at the time was ~ 310 PPM. Entire regions undergoing rapid glacial retreat, mere cycles of the earth system, no cause for alarm. In 1934, scientists did actual science. In the modern era of post-normal science, with billions of dollars of CO2-centric funding at stake and reputations to advance, it makes perfect sense to generalise that carbon dioxide pollution is the only thing responsible for the world’s changing climate. Who cares that the “geological records [show] clearly established cyclic changes in climates..” ! “Throughout the world the climate is changing,” Mr. Cotsworth continued. “The glaciers of Alaska and Western Canada are retreating. The great Sahara Desert is moving south, drying up Nigerian rivers and the lakes of western Sudan. Australia’s deserts are increasing. The ice cap along the Antarctic, opposite Australia and New Zealand, is receding. Mr. Cotsworth is of the opinion that the greatest single factor governing climatic changes in the Northern Hemisphere is the ice cap on Greenland. 22 Jan 1945 – THE WORLD’S CHANGING CLIMATE – Glaciers retreating, ice caps melting, deserts growing. CO² at the time was ~ 320 PPM. 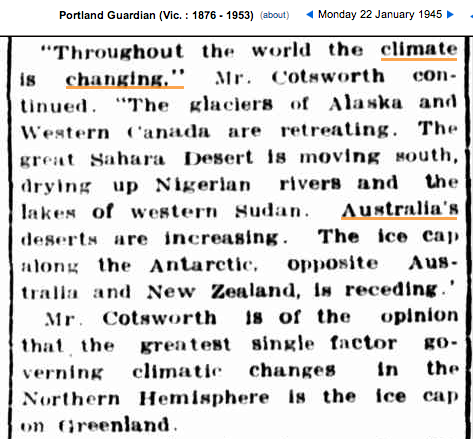 In today’s enlightened world of Government funded climate science, Mr. M. B. Cotsworth would have been stripped of funding, excommunicated from the field, publicly vilified for dissent against the orthodoxy, posted up on DeSmogBlog and labelled a denier for claiming radical climate change was due to anything other than man-made carbon dioxide pollution. 31 Mar 1951 – WEATHER REALLY IS CHANGING NEW YORK, Friday – Diminished sunspot activity. It’s so utterly damning that I’m going to run it in full without further comment. Can’t repeat this often enough. Global warming is the greatest and most successful pseudo-scientific fraud I have seen in my long life. Ten days ago, Harold Lewis, Ph.D., emeritus professor of physics at the University of California, Santa Barbara, tendered his letter of resignation to Curtis G. Callan Jr., Princeton University, president of the American Physical Society, because Dr. Lewis finally realized that he could no longer support what he called the “successful pseudo-scientific fraud” of global warming. Recall the words of New Deal brain-truster Stuart Chase who, after visiting the Soviet Union in the 1920s, asked with incredulity, “Why should Russians have all the fun remaking the world?” Progressives are very resilient, so when Soviet communism finally collapsed after 70 years of world wide tyranny, progressives and liberal Democrats pushed the existential green movement to the forefront, which was in reality the same old exhausted red communism in a new disguise. Green is now the new red (communism). MUST READ – Heresy and the creation of monsters | Climatologist Judith Curry – Climate Etc.